5.00am. Dawn light is beginning to streak an indigo night sky. The battered caravan seems deserted. A brisk rap on its door by my colleague Ben breaks the silence. This is the early morning outreach shift in an outer London borough. In this road adjacent to a park there are a line of assorted vehicles, most of which appear to be derelict. My two outreach colleagues, Ben and Helena, between them speak Czech, Romanian, Hungarian, Russian and English. Eventually there is a rustle from inside and the heads of a man and women emerge. There follows an amiable conversation with Ben who has met the couple before. They are Romanian and working to earn money for their extended family back home. Previously the caravan was located beside another park nearby, but they were required to move from there by the police. The couple paid a vehicle removal company to transport the caravan to this new site. Ben asks after the child who was previously living in the caravan with them and they explain that he has been taken into care by the local authority. The couple are in close contact with social workers and hopeful that the child will be returned to their custody shortly. The man has been working regularly, mostly on building sites for small contractors at below minimum wage rates. This type of unregulated labour is part of the vast ‘informal economy’ based on cash-in-hand payments. Every morning he gets up at 5.15am and joins a line of men waiting patiently in a car park nearby, ready to be picked up by a contractor’s van. Along from the caravan is a car and its two genial male occupants are pleased to converse with Ben in their own language. The police, they tell him, know of their presence and they proffer documents as proof that they are working legally. Beside the car is a large plastic container full of water. As I pass by later, they are using the water to give themselves a rudimentary wash. Entering the park, we follow the light of Helena’s torch to an encampment hidden away in scrubby undergrowth behind a small copse of trees. In the mouth of a tent sits a balding middle-aged man, his shirt unbuttoned down to the waist despite the temperature hovering close to zero. There follows an animated, finger-jabbing debate with Ben. At one point he interrupts Ben and turns to me, thrusting his face forward and stating emphatically - ‘me no drink’, slapping his chest in time to each carefully articulated word. Ben informs me the reason for this animosity is that the man is frustrated by the authorities always seeking to move him on. He believes they should be more welcoming and provide some basic accommodation for people like him who are undertaking work that the lazy English won’t do themselves. He has disdain for the poor work ethic of Londoners. In his view they are happier living on benefits and drinking alcohol. His diatribe seems uncannily similar to the florid descriptions of Romanian migrants delivered by certain politicians opposed to current levels of EU migration. As we scrabble through the undergrowth back to the main path I reflect with Ben and Helena on the challenges of working with this particular group of rough sleepers. Most are Romanian Roma. The Roma, an ethnic group scattered across central, eastern and southern Europe, suffer very significant discrimination. In stark contrast to the lurid media stories of Roma entering the UK to beg and claim benefits, the people we have met this morning are proudly self-sufficient with a strong work ethic and few support needs. They are prepared to work to earn a wage that is exploitative by UK standards but considerably more than they would earn in Romania. Rough sleeping associated with economic migration is a contentious, politically sensitive issue and it is rather easier to generate feelings of dismay and condemnation than to offer solutions. There are aspects of what I have witnessed this morning which are deplorable. 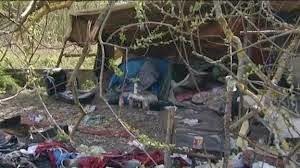 Parts of the park are out of bounds to the public because of the encampments and encircling detritus and it is understandable that local authorities will seek to recover public space, working alongside outreach teams who can support people slipping into destitution to return to their countries of origin whilst urging and assisting those who can work to legitimise their employment situation in the UK. But for people who have little, the financial reward for undertaking unskilled work in this country is considerable. The cost of even basic private rented accommodation would eat significantly into their earnings and the temporary hardship of sleeping rough is, they conclude, worth enduring. Yet I ponder the heavy price being paid by the couple in the caravan whose child has been taken into care. And meanwhile, the flourishing informal economy provides a troubling backcloth to this transient way of life, undercutting wages and creating an environment where exploitation can thrive. Recently the UK government announced a package of proposals designed to deter EU migration, including the imposition of a four-year period before in-work benefits can be claimed. This will reduce the already slim chances of working migrants finding affordable accommodation and increase the disincentive to legitimise their employment status. The proposals are highly likely to increase the number of migrants sleeping rough. They will also, of course, deliver a barrow-load of votes. The child has been taken into the care of the local authority ? I would be collecting my child and going back to where I`d come from rather than lose my child. The couple were meeting regularly with social services and hoping to have the child back in their custody in the near future. What their plans were from there, I do not know. I found your blog extremely insightful and enlightening. We are making a unique non-profit short film in the UK film this winter, which will highlight one aspect of the Roma experience here in London. It is a fictional narrative, which is trying to create a cultural bridge between the local community and the transient Roma community here in London. It explores not only their social circumstances but also cultural superstitions and traditions. We have been working extensively with both charities and the local community and our aim is to keep an accurate authenticity in our portrayal. We have a wonderful young UK Roma actor in the lead and it will be a great opportunity for him to be able to work here in London. We are crowd funding for the project and the reason I am contacting you is we need as much support as possible to spread the word. It will be an important film for the UK and even mainland Europe, where as you know, the portrayal of the Roma is often prejudice and stereotypical. We understand if it is not policy to openly support our project but it may be something you would be interested in personally supporting by sharing the information. If you don’t mind I will forward you a link to the campaign in the coming days or if you can contact me by email I will explain more about the project. I am very concerned at the deteriorating conditions of the sites where Roma are sleeping rough with the intention of working. They are increasingly at risk of exploitation and even of being trafficked. It is grim.